Title Evangelical Harmony: / or the / History / of the / Life and Doctrine / of Our / Lord Jesus Christ, / According to the Four Evangelists, / in Two Volumes. / by the Rev. Hen. Rutter. / Vol. I. 9of two) / London: / Printed by Keating, Brown and Keating, No. 37, Duke-Street, / Grosvenor Square. / 1803. / Entered at Stationer's Hall. Contents A Harmony of the Four Gospels by Father Henry Rutter (1755-1838) using texts of the Rheims Version as revised by Challoner and the Witham Version. Title The / Life, Doctrine, and Sufferings / of / Our Blessed Lord and Saviour / Jesus Christ, / as Recorded by / The Four Evangelists, / with / Moral Reflections, Critical Illustrations, and Explanatory Notes. 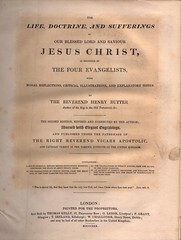 / by / The Reverend Henry Rutter / Author of the Key to the Old Testament, &c. / the Second Edition, Revised and Corrected by the Author; / Adorned with Elegant Engravings, / and Published under the Patronage of / the Right Reverend Vicars Apostolic, / and Catholic Clergy in the Various Districts of the United Kingdom. / London: / Printed for the Proprietors, / and Sold by Thomas Kelly, 17, Patertnoster Row; G. Leigh, Liverpool; P. Grant, / Glasow; T. Ireland, Edinburgh; W. Challoner, Henry Street, Dublin; / and May Be Had of All Other Booksellers in the United Kingdom. / MDCCCXXX. Comments An revised edition finely printed in large quarto. Title The / History / of the / Life of Our Lord Jesus Christ, / from His Incarnation until His Ascension, / Denoting and Incorporating / the Words of the Sacred Text from the Vulgate. / also, / The History of / The Acts of the Apostles. / Connected, Explained, and Blended with Reflections. / Translated from the French of / Father Francis de Ligny, / of the Society of Jesus, / by Mrs. J. Sadlier. / New York: / D. & J. Sadlier & Co., 164 William Street. / Boston: - 128 Federal Street. / and 179 Notre-Dame Street, Montreal, C.E. / 1851. Contents Vol. I contains a Gospel Harmony. Vol. 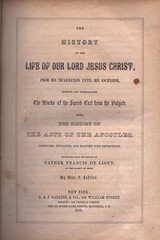 II (dated 1852) contains a paraphrase of Acts. 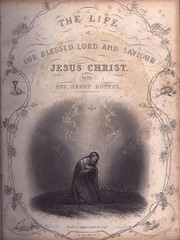 Translated into English by Mary Ann Sadlier (1820-1903), wife of one of the publishers. Title The Life / of / Our Blessed Lord and Saviour / Jesus Christ. / by the / Rev. Henry Rutter. Contents A Harmony of the Four Gospels by Father Henry Rutter (1755-1838) using texts of the Rheims Version as revised by Challoner and the Witham Version. At the end are added several biographies of saints from Rev. Alban Butler's work. Title The / New Testament Narrative / in the / Words of the Sacred Writers / Translated According to the Vulgate. / with / Notes, Maps, Chronological and Other Tables. / London: / Burns, Oates, and Company, / 17 & 18 Portman Street and 63 Paternoster Row. / 1868. Contents A harmony of the Four Gospels plus commentay on the Acts and Pauline Epistles. Comments This appears to be the first edition of a frequently reprinted work. 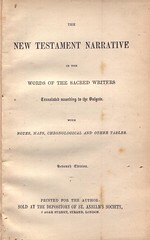 Title The / New Testament Narrative / in the / Words of the Sacred Writers / Translated According to the Vulgate. / with / Notes, Maps, Chronological and Other Tables. / Seventh Edition. / London: / Printed for the Author: / Sold at the Depository of St. Anselm's Society, / 6 Agar Street, Strand, London. Comments Despite the reference on the title page to "Author," none is mentioned in this work.